Dausa (Devanagari: ????) 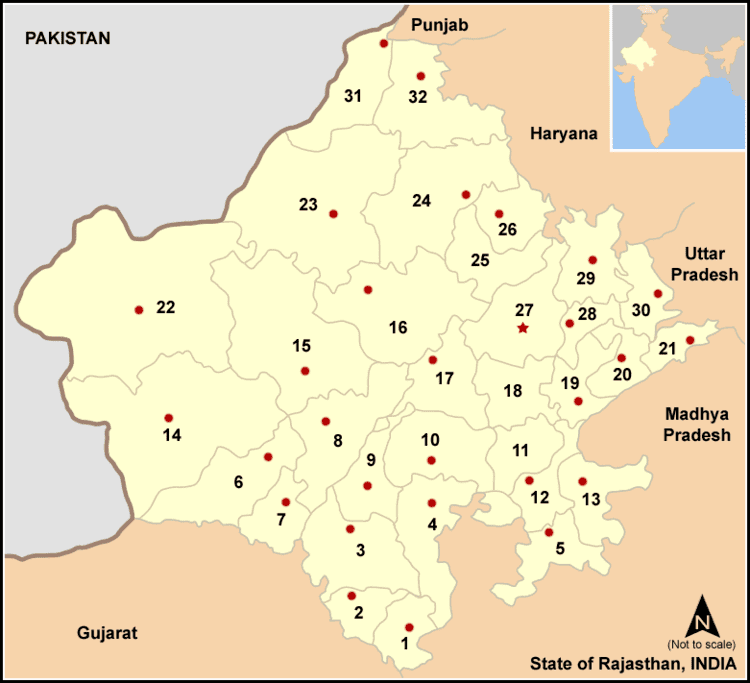 is a city and administrative headquarters of Dausa district in the state of Rajasthan, India. It is 55 km from Jaipur, 240 km from Delhi and situated at NH-11. It is also known as "Dev Nagari." In April 2015, Dausa reached infamy due to the death of a well off resident farmer Gajender Singh, of Jhamarwada village, during a political rally in Delhi. The resultant national furore on the media brought attention to the larger issue of farmer suicides during the last decade in India, the current agrarian crisis, the issue of seed monopolies by companies like Monsanto and the apathy of the central and state governments to this issue. 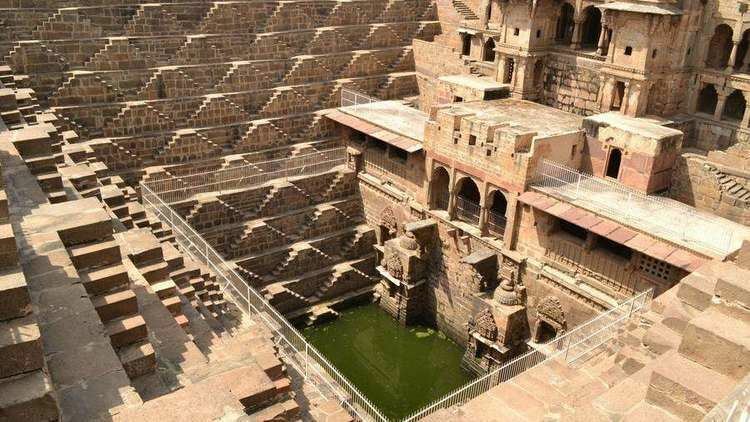 The city of Dausa is situated in the north-eastern region of Rajasthan, a region widely known as Dhundhar it was ruled by Gurjars. Dausa was an important political place for Dhundhar region. The Gurjar ruler Manthan Dev ruled this region during the 9th century AD is evident from Rajor inscription. As Dausa city is surrounded by Mahadev in five directions (Nilkanth, Gupteshwer,Sahajnath, Somnath and Baijnath),so it was named from Sanskrit word "Dhau and Sa". Dhau means Swarg sa (Like Heaven) and Sa means Sundar ( Beautiful). Means Swarg sa Sundar ( Beautiful like Heaven). Dausa has given prominent freedom fighters to the nation. Late Shri Tikaram Paliwal & Late Shri Ram Karan Joshi were amongst the freedom fighters who gave their valuable contribution for fight for independence and for amalgamation of the Princely States to form Rajasthan State. Late Shri Tikaram Paliwal was the first elected Chief Minister of Rajasthan in 1952 after independence. Also, Late Shri Ram Karan Joshi was the First Panchayati Raj Minister of the Rajasthan state who submitted the First Panchayati Raj Bill in the Vidhansabha in 1952. The famous poet of the traditional worship by poetry, Sant Sunderdas was born on Chaitra Shukla Navami in Vikram Samvat 1653 in Dausa. He was a renowned Nirgun Panthi Sant and wrote 42 famous Grantha, out of which Gyan Sundaram & Sunder Vilas are famous. Dausa is located at 26.88°N 76.33°E? / 26.88; 76.33. It has an average elevation of 333 metres (1072 feet). It is one of the 7 Districts of Jaipur division and is surrounded by Jaipur, Alwar, Sawai Madhopur, Karauli, Bharatpur and Tonk. The total area is 3404.78 km2 in roughly C shape tampering towards east and west at corners. The soil of the district is yellowish to dark brown dominantly fine textured, generally suitable for all type of crops. The mountain ranges in Dausa are part of North Aravalli Range. Banganga and Morel are the major rivers in the area, these rivers have dried now and there are 36 dams. The folk art of Hela-Khayal is a unique singing style of this region. Its uniqueness lies in its traditional singing which is highly stylized yet it has now been skillfully employed to comment on the current socio-economic-political scenario in a satirical manner. Extremely popular among the village folk of Dausa, Hela singers demonstrate and typify the undying spirit and zest for life of its people. In dausa district MEENA songs is very famous. Mr. Visnu meena from Patlas is very famous singer. At the marriage time ladies songs is very popular. 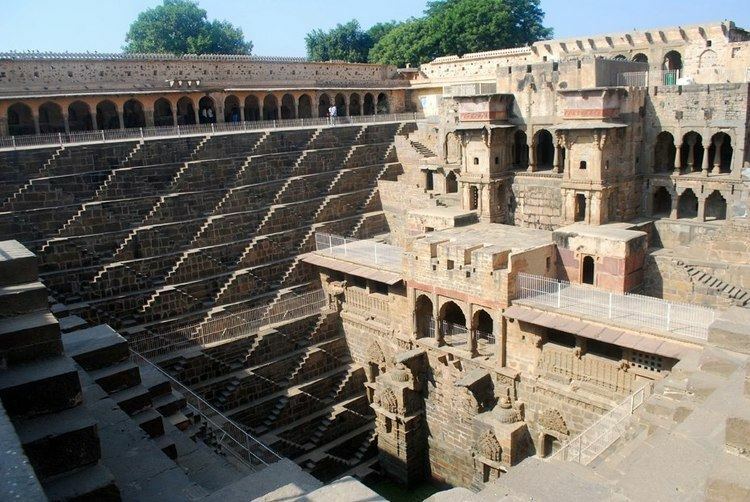 Abhaneri: Abhaneri is famous for its post-gupta or early medieval monuments. It is situated at about 33 km from the district headquarters towards Bandikui. 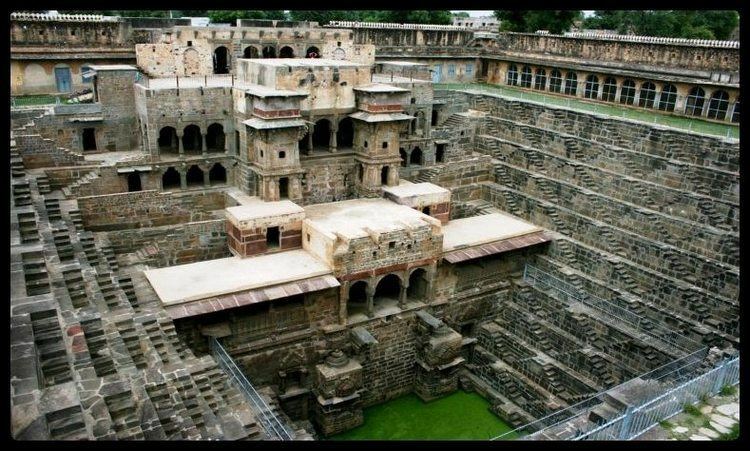 The Chand Baori (Step Well) and Harshat Mata Temple are the important places to visit. Bhandarej: Bhandarej is famous for walls, sculptures, decorative lattice work, terracotta utensils etc. found in excavation. It is situated at about 10 km from the district headquarters towards Sikandra on NH-11. Khawaraoji: Khawaraoji is famous for residence of the then ruler Raoji and natural beauty. It is situated at about 25 km from the district headquarters towards Sikrai. Though, it has typical way to reach this place, the fort like 350+ years old residence is converted into the Hotel Khawa Palace. 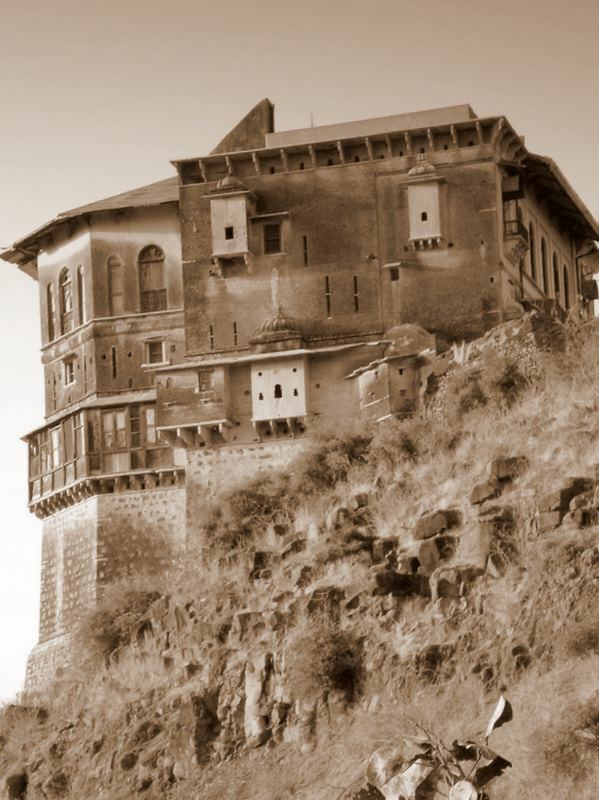 There is one more fort on the top of hills which is said to be 1200 years old. Surrounded by hills on three sides, and having Amol Ghati nearby with natural beauty, this place has worth to visit by tourists. There is a Lake behind the hills in Khawaraoji Village. With beautiful hills, lake and desert it is a treat for the tourists to visit the place. Jhajhirampura : Jhajhirampura is famous for the natural water tank and temples of Rudra (Shiv), Balaji (Hanuman) and other religious god and goddess. It is situated at around 45 km from district headquarters towards Baswa (Bandikui). Surrounded by hills and with natural water resource, this place has natural and spiritual glory.